We would ask - what would these souls, so recently passed over, want of us the living here today? Certainly not vengeance, certainly not more bloodshed. The quote from Ghandi is quite apt - "An eye for an eye makes the whole world blind." This article explores the astrological significance of the chart for the September 11th terrorist attacks in New York and Washington, DC that killed 5,000 people and left America feeling defenseless for the first time since the Second World War. The national mood swung wildly between anger and compassion in the wake of this immense tragedy, and whatever the outcome may yet be in terms of global politics, it is certain that all dates in the 21st Century will be referenced as "before September 11th 2001" or "after". The American economy, already staggering, also took quite a hit. All in all, such a cataclysmic event for our nation must have astrological referents. Let's try to see what they are (see chart ). The first thing to notice is of course the Saturn-Pluto opposition. Astrologically, Saturn opposed to Pluto represents an irresistible force up against an immovable object. Pluto is a force for change, very likely drastic change, change that may come from the dark, unknown and repressed element. Pluto is represented by the symbol of the Underworld. In contrast, Saturn represents existing structure of our lives, life above ground, the physical and mundane plane of existence, the status quo. This is inherently a powerful confrontation. We have all of us been feeling the stress of this combination individually, at least since the Spring time frame. It has been an intense time of personal transformation for everyone, even before the tragic events of September 11th took place. In order to gain perspective on how this opposition has been playing out for our nation collectively, it is instructive to look at the chart for the United States, July 4th, 1776. Experts disagree about the time, but one time that is often used is approximately 5:10 PM (Sibley chart). This chart was rectified by the great American astrologer Dane Rudyhar to 5:13:55 PM and published in his seminal work "The Astrology of America's Destiny." ( ). If we place the transits for the time of the attacks onto this chart for the U.S. ( ) we see immediately that the Saturn-Pluto opposition lies directly across the Ascendant-Descendant axis of the U.S. chart, in fact that the rising point of the chart, at 13+ Sagittarius, is directly between the Saturn degree of 14+ Gemini and the Pluto degree of 12+ Sagittarius. Another way to put this is that the Saturn-Pluto midpoint, at 13+ Virgo, exactly squares the U.S. Ascendant. So the U.S. chart was directly activated in the timing of the attack event. A Saturn-Pluto opposition across the Ascendant-Descendant of an individual entity implies radical transformation, possibly through a painful event of some enormous magnitude, a death and re-birth experience. It is as if the entire American population has been undergoing a near-death experience, collectively. One way that Saturn-Pluto manifests is by means of an earthquake, or a volcano, where the destructive force underground finally breaks through to the surface. In this case, similar to an earthquake, structures collapsed and many lives were lost in the cataclysm. It is important to realize that the profound astrological significators for this event imply that some archetypal process was acting itself out in America, independent of individual actions, that there's a way to see this event in purely symbolic and iconographic terms. And Saturn-Pluto is a perfect representation for the terrorists attacking the existing structures of power, coming as they do from the dark unknown places in the underground of civilization. As in the case of an individual psyche racked with hidden complexes and compulsions, also symbolized by Pluto, these terrorist elements gathered their toxic strength in the dark, removed from the world dialog, essentially unheard voices in the course of Western progress, representing as they seem to do the displaced Palestinians, and the Iraquis, whose civilian population has been decimated by a decade of economic sanctions, both without much recourse in the world dialog. As astrologer Caroline Casey has pointed out, whatever is excluded from the world dialog becomes toxic. There is a way to look at this event in karmic and evolutionary terms, as part of a process of necessary change that was not being admitted to in the body politic of America and the West. This is not to excuse what the terrorists did, obviously they made the wrong choice, of hatred over love. But we must try to understand some of the reasons. It is also important to note that whenever Pluto destroys something there is the space created for new birth. Pluto represents chaos, but the chaos is a necessary precursor to the new forms entering in. So what we should be asking ourselves as we mourn the losses is not only what has been destroyed, but also: what now is coming to birth? We have choices also in how we respond to the events of September 11, both individually and collectively. The Saturn-Pluto opposition runs for a relatively long period of time, in this case up to a year. It was exact last August 5th, it will be exact again on November 2nd, and again in late May 2002. So we will want to ask ourselves, what were the more specific astrological triggering factors for this event. But let us be clear: the planets didn't cause this tragedy to take place. The planets represent an oracle whereby we can see the patterns of earthly events, but are not a cause of events in and of themselves. The opposition was triggered by Mercury. Mercury on the Ascendant of the chart for the attacks was exactly trine Saturn, and sextile to Pluto, and conjunct the Ascendant of the chart within a few minutes of a degree, and also exactly conjunct U.S. Saturn. That Mercury was so involved indicates that this attack was a message... a chance for greater consciousness and awareness. The events indeed send a powerful message to the Western population about the inter-dependence of America and the rest of the world. As a nation we are not invulnerable, as many may have thought before this disaster took place. In that sense we are not insulated from the rest of the world, as we may have wanted to believe. Jupiter was also a triggering influence in this event. Jupiter was exactly one sign ahead of Saturn, in Cancer, and therefore aspecting the Saturn-Pluto opposition also. Jupiter in Cancer represents the sign of its exaltation, stressing love and brotherhood. And Jupiter and Saturn together represent social agendas. They conjoined in May 2000, and marked at that time the beginning of a new era in world society. It was at the moment of the September 11, 2001 attacks that we began to see what form this new social reality would take. That Jupiter is in Cancer speaks of the spiritual nature of the event, for all Americans, indeed for the free world. In spite of the horror, we have also seen positive consequences. The reaching out of people from all over the world in sympathy with victims, and their families, the donations to the American Red Cross, and the thousands of acts of selfless heroism that emerged in the wake of the tragedy, the phrase "I love you" on everyone's lips, the possibility that Americans will be more in touch with the suffering of other people around the world as a result of these events, the plans to drop food as well as bombs on Afghanistan, surely unprecedented in the history of warfare, all speak to the higher purpose of these events, in terms of pulling together as a common tribe of man, the highest meaning of Jupiter in Cancer. In regard to the positive side we note also that the transiting Node of the Moon was conjunct the U.S. Venus-Jupiter, in the Seventh House of the U.S. chart, at the time of the attacks, a very significant astrological symbol that cannot be ignored. Although it is difficult to say this, there was a sense in which this event was somehow fated, and may eventually lead to the generosity of Americans toward the rest of the world, as well as act as a stimulant to their anger. Another trigger of this event astrologically was that this summer, on June 21st 2001, there was a Solar Eclipse at 0 degrees Cancer, the same sign as the U.S. Sun and very close to U.S. Venus. Eclipses typically take several months to work themselves out in earthly affairs. Events may show up when the eclipse point is subsequently triggered by transiting planets, especially Mars. And transiting Mars had just reached it's opposition to the eclipse point the day before the event, just as the Moon conjuncted Saturn and squared the transiting Sun, on the Quarter Moon of Monday September 10th which preceded the next morning's attacks. On Tuesday September 11th the Moon was still in Gemini, widely conjunct Saturn, while the Saturn/Moon midpoint exactly conjoined U.S. Mars, also in the seventh House of the U.S. chart. It is interesting that Saturn was in Gemini, especially as we can regard Saturn as the structure that was destroyed by the Plutonic forces, namely the twin towers of the World Trade Center. Gemini also represents the Descendant of the chart of the U.S. for 5:13 PM July 4th 1776. In fact, the Descendant of an entity's chart represents the way that entity reaches out to partnership with the rest of humanity, namely in the case of America as symbolized by Gemini in the form of communication, commerce and trade. And since Gemini is the sign of the twins, this symbolic identification with the structure of the World Trade Center is quite apt. Gemini on the U.S. Descendant can also be conceived as the two-fold foreign policy of this nation toward the rest of the world. The U.S. chart has a complex seventh House, with both the Jupiter-Venus conjunction and also Mars, representing both the generosity of America and also its military might, two ways in which we deal with our international neighbors, the hand that gives and the hand that takes. And both sides were strongly aspected by the September 11th events. So we have an American World Trade Center, located near the Statue of Liberty in New York harbor, in the form of twin towers, representing the Gemini Descendant of the U.S. chart, and way the United States reaches out to its neighbors around the world. This was the cultural icon that represented the economic might of America, and that the terrorists wanted to destroy. Of course the tallness of the towers also represents the preeminence of U.S. economic power in the post WW2 era. Now let's look at the chart for the opening of the twin towers. The ground-breaking that preceded this opening was on August 5, 1966, at the tail end of the previous Saturn-Pluto opposition, and the same day as the first exact Saturn-Pluto opposition of 2001. The actual ribbon-cutting ceremony for the World Trade Center was on April 4, 1973 ( ). In this chart, the Sun is conjunct Chiron, indicating some painful consequence, and as well the opportunity for healing. Saturn is appropriately in Gemini, at almost the same degree as at the time of the attacks, which took place some 28 years later. So the World Trade Center was about to undergo its own Saturn return at the time of the attacks. Now let's look at this chart in comparison to the chart of the U.S. ( ). It is striking that Saturn and Pluto are emphasized in this comparison. Pluto is directly on the U.S. Midheaven, representing power through control. Saturn is on the Descendant of the U.S. chart - entrenched power and mentorship in relation to the rest of the world. What are we to make of the Saturn-Pluto affinity? There it is, right from the beginning of the World trade Center as a representation of America's national preeminence on the world stage, and as a sign of its policy toward the rest of the world also. If we look back to 1973, when the twin towers were opened, we might recall that the U.S., through the CIA, was in the process of helping to overthrow Chile's popular socialist president Salvador Allende, in a bloody coup that was followed by right-wing repression that left many hundreds of people disappeared, dead or imprisoned. This event, which also took place coincidentally on September 11, echoed U.S. foreign policy in many other parts of the world, notably Central America, in Guatemala and later Nicaragua. The U.S. has become a feared nation, a producer of state-sponsored terrorism. The hand that gives, and the hand that takes. If you would like to see a detailed account of America's clandestine foreign policy activities, check out "The CIA's Greatest Hits" by Mark Zepezauer. So we have seen that Saturn and Pluto were emphasized in the chart for the opening of the World Trade Center, as well as in the chart for its destruction. This important fact reveals that terrorism begins at home, and that if we want to identify the dark forces responsible for the events of September 11th, we would do well to consider the part played by our own government over the years, including the destruction of Iraq through sanctions at the end of the Gulf War, in contrast to the period of rebuilding and reconstruction that was offered to Germany in the aftermath of World Wars I and II. If we as a nation could become more sensitive to the suffering of all people everywhere in the world, rather than just people that look like us, future tragedies of terrorism might be averted. Otherwise, we will have only the escalating cycle of violence of a world at war with itself. In other words, there really is no enemy. America has declared war on its own collective shadow. In looking at the Saturn-Pluto opposition of 2001-2002, it is instructive to look back to the beginning of the current cycle, which was in November of 1982 ( ). 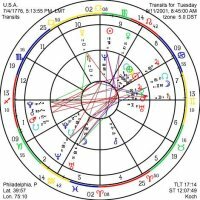 This Saturn-Pluto conjunction took place in the tenth House of the U.S. chart, in the same sign as U.S. Saturn, trine U.S. Moon and exactly square U.S. Pluto. The transiting conjunction's aspect to U.S. Moon implies that the public perception was somehow involved. The theme of underground power and control is shown by Pluto in the tenth House, and as we think back to those times, secret power and control was indeed being exercised by the new right-leaning republican administration of Ronald Regan. The Iran-Contra scandal, which was about to break, revealed a pattern of state-sponsored terrorism on the part of the United States that was relatively unprecedented. The Contras in Nicaragua were systematically torturing and killing the civilian population in order to prevent the popular Sandinista government, recently elected, from remaining in control of the country. The Contras could not be legally funded by the U.S. government, due to congressional prohibition, but they were funded by Regan's administration with redirected money from secret arms deals with Iran, who was our supposed enemy, and another totalitarian regime favorable to terrorism. Of course, Regan's vice president was George Bush senior, who was reportedly involved up to his eyebrows in Iran-Contra, although this fact was never conclusively proven. Under his administration there were several military excursions, such as the invasion of Panama, which killed thousands of innocent civilians. Finally, in 1991, we had the Gulf War, and subsequent bombings and economic devastation through the ten years of sanctions, which created enormous hatred in the Arab world and which may have been one factor in the September 11 attacks. In the chart for the first World Trade Center bombing, which took place on February 26, 1993, we note that the transiting Saturn-Pluto cycle is again involved, this time the waxing square ( ). Jupiter, in retrograde, occupied almost the same degree as Mercury in the chart of the September 11 attacks, conjunct U.S. Saturn. Stationary Pluto, conjunct U.S. Moon, had just turned retrograde that same day. Of course this earlier terrorist act was also reportedly promulgated by bin Laden's network. When the new Millennium dawned on January 1st, 2000, it featured a conjunction between Pluto and Chiron, indicating that some powerful and painful healing might be involved with the unfolding events of the 21st Century. It is interesting in this regard that the Quarter Moon the day before the recent attack event opposed exactly the Pluto/Chiron midpoint. The last Pluto-Chiron conjunction occurred in July 1941, near the beginning of the American involvement in World War II. After January 1, 2000, Saturn began to move closer to its original position when the WTC towers were opened, and entered Gemini on August 10, 2000. Two days later there was an incident at the World Trade Center, in Tower 2, when an elevator struck the top of the shaft and eight people endured a hair-raising rescue, eventually escaping with injuries. This brings us up to the present. In the aftermath of the attacks, rather than involving the U. N., or another legally constituted world consortium of nations, the republican administration of G. W. Bush Junior has chosen to pursue basically a unilateral policy of attacks on terrorist camps and the controlling Taliban rulers of Afghanistan, the new Viet Nam of our era. Of course this unilateral policy is enraging many of the Arab ultra-nationalists that have been rising up in anger around the world in response to the past decade of American high-handed methods in dealing with the Middle East. It is also becoming known that the U. S. has long had the Taliban regime on it's list out of concerns for the stability of planned Unilocal oil pipelines through the region. Since there is also a distribution of food in this military campaign, we can only hope that this war will be different, and that G. W. can still prove his credentials as a "compassionate conservative." Perhaps there can be a relatively peaceful reconstruction. Something must be done, and soon, to stop the cycle of violence. So we have the terrorism out there and the terrorism within our own government. And we have the endemic lack of awareness, or even interest, on the part of most Americans about tragedies and deaths in other lands. It could all be changing in this new era of American vulnerability. And this is the real message of Saturn-Pluto, that change is necessary, change is inevitable, that we must make the change. And that we as a nation have to choose between trying to promote the concept of a world at war or a world at peace. In the seventies Rennie Davis said "Viet Nam is such a jewel," which was a rather terrible thing to say, because that war was so horrific. What did he mean by that? He meant that the increase in consciousness was worth even the suffering that brought America to it. Now America is involved in another war, not really very different from all the other ones. For each one of us, the war brings the Saturn-Pluto opposition home in an extreme fashion, brings to each heart among us the call for urgent transformation. It is important for us to realize that we have to work on ourselves first. As we heal the anger and lack of compassion within each one of us, so will the world be healed.